At Chasing Treasure, we take great pride in providing our customers with jewelry boxes that are lined with soft textiles that help prevent damage to precious metals like gold and silver. The soft sueded fabrics and velvet-like fabrics help prevent scratches. When you spend good money on a beautiful, heirloom quality jewelry box, it is nice to know if you are putting real jewelry inside of it. Fortunately, there are several tests you can do to check whether the silver pieces you have are covered in inexpensive silver plate or if they are made of real Sterling silver. While silver plating makes beautiful jewelry, plated silver is not considered precious or “real” silver. In the world of jewelry and silver work, the only “real” silver is Sterling silver. Fortunately, the easiest way to tell if your silver is Sterling is whether or not it has a hallmark. These hallmarks will be stamped as: Sterling silver, .925 (or higher), or have a lion on it. Nearly every piece of real silver will be stamped. But, when it comes to silver plate, most is not marked. But, if it is, the marks will say whether the piece was electroplated (EP), electroplated nickel silver (EPNS), or it will simply say silver plate. The challenge with determining whether silver is real or not comes with the grade. Most silver jewelry is not 100% silver, because the metal is soft and malleable. Usually, silver is combined with another metal to make it a bit less malleable. Each piece of real silver should be graded and stamped with the grade. There are just a few commonly seen number. Most jewelry will be stamped with .925, but some antique pieces will have a .950 mark. Now, jewelry that is made in Europe has a .835 stamp. Pieces of sterling from the early 1700s will often be labeled with a stamp of .958. If you have investment-grade silver, it will say .999. While you will not be able to determine the grade of silver on your own, you will definitely be able to determine if the piece of jewelry you have is actually silver. The first and easiest test is the magnet test because silver does not stick to magnets. If the piece sticks to a magnet, it is not silver. If it does not stick, it still might not be silver. Another fun test to run is the ice test. Silver conducts heat and cold quickly. So, if you put silver in a cup with ice cubes and a bit of water, the silver will become cold very quickly. If it takes more than 10 seconds, then the item is most likely not made of silver. If you are unsure, put a piece of a different metal into the cold water and see how long it takes to cool. The silver will be noticeably cool extremely quickly. The last test that you can do at home is the sensory test. You do this with sight and smell. Real silver will have an actual smell - especially when it is wet or warmed up. It also has a noticeable sheen with a touch of warm yellow. None of these do-it-yourself tests are perfect. The best way to find out if a piece of jewelry is real Sterling silver is to take the piece to a quality jewelry store and let the experts make the decision. Girls Jewelry Armoires - The Perfect Christmas Gift! Girls need jewelry boxes - big jewelry boxes. At Chasing Treasure, we offer a beautiful collection of jewelry armoires designed to look perfect in girls’ rooms. Our jewelry armoires are made of quality materials and they are painted in lovely finishes. Each jewelry armoire includes several compartments, drawers, and cupboards for all types of jewelry so every piece has a place to rest safely and securely. Our girls’ jewelry armoires are sized just right for girls, so the drawers, cupboards, and compartments are all within reach. Each of the armoires stands between 30 and 37 inches tall, so they are accessible for young girls. Because many of the jewelry armoires have small parts, it is recommended that girls ages 8 and older use them. These jewelry armoires are sized just right so your special girl can access all of her favorite jewelry. She will have fun organizing and caring for her treasures, trinkets, and jewels. The jewelry armoires are furniture quality pieces that will quickly become family heirloom pieces. These armoires could easily be passed down through the generations. 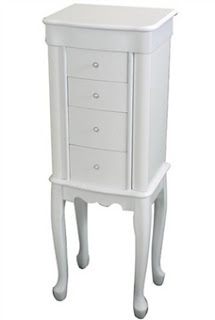 All of our jewelry armoires are painted in white or pink. They are designed in traditional styles that fit with all decor. Each armoire closes up tightly to protect jewelry and other treasures. Each armoire also comes with a lid that includes a useful mirror that helps with getting ready each day. The armoire drawer, cupboards, and compartments are lined with textiles that keep jewelry safe from scratches. The armoires include draws that are perfect for bracelets, ribbons, and other large accessories. The cupboard drawers are designed with hooks so necklaces have safe places to hang. The lids open up to reveal ring rolls and compartments for earrings, too. Each cupboard and drawer has a handle that is designed for small hands, too. These armoires will quickly become favorite furniture pieces for young girls who love to organize their special belongings. Our girls jewelry armoires are made by companies who are proudly located in the USA. Mele Jewelry Box Company is one of our popular manufacturers. This company has been making heirloom quality jewelry boxes for over 100 years, even surviving the tough times of the Great Depression. Mele Jewelry Box Company builds their jewelry boxes with quality materials and excellent craftsmanship. Chasing Treasure jewelry boxes and armoires are excellent choices for gifts. Each of our jewelry boxes and armoires comes with a 30-day return guarantee and a one-year warranty. We take pride in our curated collection of heirloom quality jewelry boxes so you can take pride in them, too. Girls appreciate gifts like our jewelry boxes and armoires for their birthdays, graduations, and other special days. Along with our beautiful jewelry armoires for girls, at Chasing Treasure, we also have lovely jewelry boxes in coordinating designs for girls, too. Some even include the pretty twirling ballerina. Many are finished in pink or white paint so they can be given along with the jewelry armoires. Storing jewelry was never prettier for girls than with our lovely armoires.